Flip-Flops: Maitreya Gold Flip-Flops New! Glasses: Mojoti Eyewear - Laura - not more avaible-sorry! Bag: fashionably dead Purple Polkadot Backpack! Hair: TRUTH Astrid - espresso New! Flip-Flops: Maitreya Gold Flip-Flops - Pure New! Cherry Branch: KOSH - BLACK CHERRY TWIG Free! Hair: *booN YNO421 hair chestnut New! Flip-Flops: Maitreya Gold Flip-Flops - Blossom New! Labels: booN, Curio, Elate, glow studio, Lelutka, M*G*S, Maitreya, mon Tissu, PIDIDDLE, tulip. Hair: *booN DPY537 hair blonde New! Hair: Action Nicole.2 - Coal New! Skirt: LeLutka - MEDELLIN skirt/dark khaki New! Hat: theosophy Oakford Hat (Summer Melon) New! Necklace: Burroughs Lovingly - colourchange Gift! Dress: Apple May Polka Me - Black & White New! Shoes: Apple May Animal Pumps - Dalmatian New! Heels: Mstyle RIVEA Pumps - Grey Panther New! Hair: elikatira Garden - brown 10 New! Top: Kyoot Last Thread Tank - White New! Earring & Necklace: Addiction Journey Set New! Bag: Les Petits Details LpD - Flowers Bag New! Hair: elikatira Again - Blonde 07 50-linden-friday! Top: Mimikri - Dusk Leather Bustier putty New! Skirt: Mimikri - Dusk Sequin Mini putty New! Skin: Curio Acorn [Dark] Chic-Pure 1 + :GP: Chic-Dark Brows (Tintable) New! Top: izm. polo shirt and black vest LB limited Lucky Board! Necklace: SIGMA Jewels Daphne necklace (silver) New! Bracelet: Acide! Ecrin de perles V2-R New! Skin: Curio Acorn [Dark] Chic-Noir 1 + :GP: Chic-Dark Brows (Tintable) New! Top: izm. *izm.stripes flared camisole Navy New! Jeans: DIAPOP baggy jeans New! Skin: Curio Acorn Frex [Dark] Chic-Pure 2+ :GP: Chic-Dark Brows (Tintable) New! Heels: SLink Lulu Stilettos Navy New! Labels: chronokit, Curio, Fashism, Fishy Strawberry, Lelutka, Paper Couture, SLink, tulip. Necklace: SIGMA Jewels Daphne necklace (mahogany) New! 1. the shop name, if you click this name open the slurl for a direct teleport. 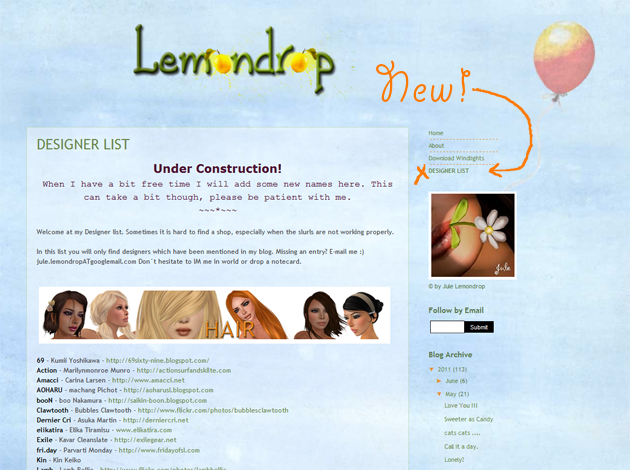 I hope my list will make shopping in sl easier and faster. All creators from there I have use items, now is my list a start, with the time I will always more complete my list, so please a bit patience with me. If something is wrong at my list, so please IM me. Which Rubrik find you in my list? Happy shopping and much fun! Hair: Exile Minx Nectar New! Shirt: DIAPOP 70-seven top - flower New! Necklace: MIEL PEZ necklace New! Hair: elikatira Little - Brown 10 New! Bag: Kloka Pochette L (black) New! Dress: Apple May Breezy - Autumn New! Heels: SLink Lulu Stilettos White New! Dress: Apple May Hemp n' Beads Necklace New! Top: Mimikri - Jackie Chiffon Blouse dots b&w New! Jeans: Mimikri - Jackie Jeans & Leggins black New! Heels: SLink Lulu Stilettos Black New!